This week's files cover: As we approach Mars expect upswing in sightings. Saturn's Moon Enceladus has giant boulders, and Radio messages from Saturn. UFOs were seen over California, Florida, Illinois, Indiana, Missouri, New Hampshire, New Mexico crash, Ohio, Texas and Washington. Many sightings were also reported in Australia, Canada, Crimea, Iraq, and United Kingdom. The purpose of these files is to report weekly the UFO eyewitness and photo/video evidence that occurs on a daily basis around the world and in space. Many people claim it is impossible for UFOs to visit Earth, I ask you only to keep an open mind and watch the evidence we accumulate each week. I personally chased a UFO over England while in the Air Force and know something strange is in our skies. The image above is a colorized version with windows inserted of July 3, 1967, 7:15 PM, Cumberland, Rode Island Mothership photo by Joe Ferriere. Thanks to Wendelle Stevens UFO Photographs. Smaller craft are launched from the belly hatch. EXETER -- An Instructor Flight Engineer on the P3 Orion and EP-3 Reconnaissance aircraft with 10,000 hours of flight time called Peter Davenport to report, "An enormous silver cigar shaped object in the sky at about a 40 degree angle above the horizon about 3:15 PM, on July 20, 2005. There were very few clouds in the sky and it was about 90% clear blue sky that day with excellent visibility. He was shocked to see a very large cigar-shaped object hovering almost motionless, back-dropped by clear, blue sky in partly cloudy conditions with west wind at 9 mph. The witness states, "I am a retired Navy Chief with twenty-two years of service. I also worked for Boeing in Everett, Washington as a Quality Assurance Manager leading a team of 65 people in the Systems Installation Division on the Boeing 777 Production Line. I've flown over the entire globe and never have I ever seen anything like this cylinder. This object was about twice the size of a modern day US Navy Nimitz Class Aircraft Carrier flying without sound. I thought it was between 2500 and 3500 feet in altitude because the clouds were at 5000 feet. There was also a row of large windows evenly spaced around the entire perimeter of the object a little bit higher than center on the object. The object was moving from the west directly toward me heading in an easterly direction and moving very slowly at less than 100 knots. There was this strange looking cloud of orange/red flames that started growing and billowing underneath the entire bottom of the object. The billowing fiery clouds reminded me of the way napalm rolls along on the vintage war film footage of Viet Nam I've seen on television except that there was no smoke associated with it. It looked as if the air itself had been suddenly ignited in a large billowing cloud of flames. Just as I was about to turn and run into the house due to fear the fiery cloud grew larger and it seemed to be pushing back toward the western end of the object and once it reached its peak (probably about half the diameter of the object) the object seemed to stretch out about twice its original size toward the eastern end of the object thus filling the entire sky in front of me and then in the wink of an eye the western end of the object caught up with the eastern end and it simply disappeared right in front of me. Mars Five year upswing in sightings. Over fifty some years there has been an increase in sightings when ever the Earth came close to Mars which occurred about every five years starting in 1947. We are again converging for a close encounter on October 30, 2005 at 69 million kilometers so sightings are likely to increase. NASA's Cassini spacecraft has coasted to its closest encounter yet - skimming just 175 kilometers above Saturn's icy moon Enceladus. But astronomers are at a loss to explain its observations. On 14 July, Cassini swooped in for an unprecedented close-up view of the wrinkled moon. Its Imaging Science Subsystem (ISS) camera has since returned pictures of a boulder-strewn landscape that is currently beyond explanation. The "boulders" appear to range between 10 and 20 meters in diameter in the highest-resolution images, which can resolve features just 4 meters across. "That's a surface texture I have never seen anywhere else in the solar system," says David Rothery, a planetary geologist at the Open University in Milton Keynes, UK. Cracks crisscross Enceladus's surface - possibly as a result of the moon being repeatedly squeezed and stretched by the gravity of Saturn and other moons nearby. But Rothery points out the boulders avoid - rather than fill - the cracks. This might indicate that the fracturing took place after the boulders had already formed. John Spencer, a Cassini team member agrees that the images are puzzling. "You would expect to see small craters or a smooth, snow-covered landscape at this resolution," he told New Scientist. "This is just strange. In fact, I have a really hard time understanding what I'm seeing." Mick Ohrberg writes "Scientists at NASA have now heard proof (called 'Saturn kilometric radiation') that Saturn has a phenomenon similar to the earths' Northern Lights. Talking about the eerie sounding noise, Dr. Bill Kurth with the University of Iowa, says "We believe that the changing frequencies are related to tiny radio sources moving up and down along Saturn's magnetic field lines." Editor's Note: Could ET be broadcasting from ships spotted in NASA photos? 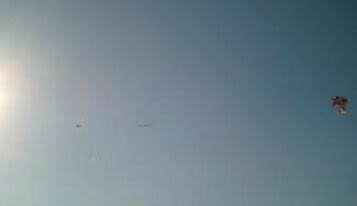 MODESTO ­ R. David Anderson writes, "I have studied my July 7, 2005, picture and have concluded that it may have been some type of aircraft." The series of lights that run parallel may have been the strobe lights on the wings of the plane. The exposure could have caused this repeating pattern as the strobe lights flashed as the plane moved. In the six second exposure, the strobe lights appear twice, once at the beginning of the exposure and again at the end of the exposure. I can't quite understand why the strobe lights didn't just show up as streaks of light if this were indeed a plane. As one can see in the photo, the strobe lights, (if that is what they were) show up as individual spheres of light. I have gone out several times at night since then and took shots of airplanes above my residence using the same camera settings and was unable to duplicate this photo. Nothing even came close. This enhancement was made by Don Burelson PhD. MUFON NM Director. I recall that when I took the picture of the string of lights object, I did not see strobe lights. It appeared as one extremely brilliant light source. The parallel pattern of lights was only evident in the photo. I think that this merits further study in order to determine how a digital camera records an aircraft at night at certain settings and at various angles. MUFON's Bruce Maccabee PhD writes, "The strobe lights show up as dots rather than streaks of light because they are brief flashes; they are not on long enough for the plane to travel a noticeable distance. For example a plane traveling about 200 mph travels about 290 ft in one second but during the time of the strobe flash, about 1/1000 of a second; it travels less than a foot. The image of a steady light on an airplane should be a streak or line that is as long as the distance the plane traveled during the shutter time. For example, at 200 mph a plane travels about 1760 ft in 6 seconds. This distance would make a noticeably long streak or line image. Experiments should be done to determine what the images of several types of planes show when photographed at night with a 6 second exposure time. 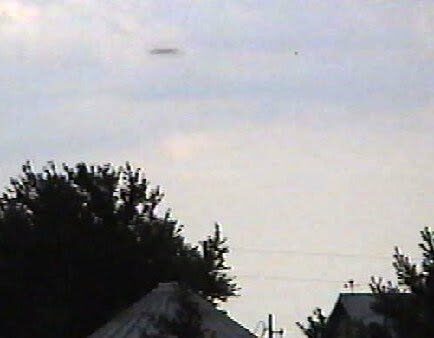 SONORA -- Mark A. Olson, D. M. had a sighting of a glowing object on July 19, 2005, at 9:12 PM, when an object appeared over my home. The object was very bright and slow moving and did not make a sound. This glowing object was trailing a conventional aircraft and both were flying due south. The object was videotaped for about three minutes before it disappeared behind the branches of a tree. A curious "flash" appeared just below this object at the beginning of the above video clip. The flash was observed during the videotaping. When the video was reviewed, the "flash" appeared in only one frame. Thanks to Mark A. Olson, D. M.
In early November, 1983, Gene Cuthbertson surveyed the miles of scorched hills east of the Villa Park stables where he boarded his mare, "Feisty." Most of the stable had been spared and he was glad to have helped in the evacuations, but the uncanny smell of smoke still dogged him. He organized volunteer horsemen to transport donated food to the surviving animals. "Feisty" was packed with grain, wild bird seed and bruised apples in two burlap feed bags. Eight riders assembled, their horses packed with edibles for the surviving wildlife. Horses were uneasy about entering the fire area, so Gene swabbed their nostrils with Vick's ointment to keep their tear ducts open and block the smell of smoke. The Morales sisters insisted on leading since they had a Minolta camera. They rode up the jagged scar of a rabbit trail into the hills, as dusk threatened to settle. Gene followed, with his German shepherd "Breta" in the lead. The riders followed at roughly hundred yard intervals. The plan was to dump food where animal tracks or birds were seen. Gene saw the Morales girls ahead of him, dissolve into the gathering darkness, but he knew where they were. Indirect lighting from the distant Riverside Freeway made the trail murky when seen from the back of a horse, so '"Breta," lead the way. Gene spread his food among rabbit and quail tracks and the scorched area was as close to hell as he might ever have imagined. Only deflated cactus and singed scrub brush survived. He became swamped in complete darkness. Suddenly, "Breta" exploded with shaking, throwing her head around, barking, and making gurgling sounds. "Feisty," acted erratic, shaking wildly, and pounding her hooves into the ground. Gene's first thought was, "rattlesnake" and feared "Breta" had been bitten. Gene began to swing out of the saddle and froze. A huge disk drifted over him, perhaps only 15 feet overhead. It glowed faintly. The ground swirled with debris and fine dust, but he remained transfixed. Both awed and dumbfounded, he hung, partially dismounted. The disk, 55-60 feet in diameter floated away at an increasing pace. Gene's dog and mare never quite settled down. He later thought that only about twenty seconds had elapsed, but his watch died and even battery replacement couldn't fix it. He could see the disk assume the classic saucer shape, its top bulge becoming more apparent. Camera flashes came from one of the Morales girls in the distance. When the disk reached the end of the fire area, two others like it appeared. They took on incredible acceleration together, swinging northeast toward Nevada and vanished. This craft is identical to the one described. Gene spun "Feisty" around and backtracked toward the stable. When he arrived, he walked "Feisty" the old-fashioned way until she was cool. He was combing the sweat marks out of the her back, when old George Thompson, the stable's caretaker intercepted him and asked if he'd seen anything unusual in the burned out hills. Gene nodded. "No one will ever believe me, so I guess I'll just take notes, file it away and shut up." Gene went home and soaked in a hot, foamy bathtub, with his loaded Ruger .44 magnum close at hand. Fear began to seep into every part of him, as the UFO encounter repeated itself at fantastic speed within his mind. Waves of nausea swept through him and he leaned over, vomiting in the trash can. He nearly panicked, but the sight of "Breta" sleeping in the bathroom's doorway calmed him. He finally got out of the tub, feeling unnaturally awkward and feverish. He dried himself poorly and grabbed his Bible as he flopped onto the bed. He started to read Joshua 1:9 and fell uneasily to sleep. It seemed like only a few seconds had passed when the ringing phone awakened him, but it was a little after dawn. He felt weak and generally wretched. George Thompson was on the phone telling him that his mare, "Feisty" had been down and that Equine Veterinary Associates had been called for her in an emergency situation. Gene wanted to rush to the stable and meet with the veterinarians, but he found his body lethargic and his thinking somehow slow and cluttered. He managed to get dressed, but when he called "Breta," she didn't move. She was limp, glassy eyed and had labored breathing. Gene's adrenalin kicked in and he phoned ahead to his small animal vet, Dr. Helmut Denberg, a specialist in German shepherds. He met with his own physician, Dr. Milton Okin and results of medical tests showed he was anemic. Veterinarian, Denberg revived "Breta" and eventually restored her health, but determined after extensive testing, that she was badly anemic. EVA later phoned in the test results on "Feisty," describing her anemia. Gene thought about possible radiation exposure, but he didn't know of anyone with a Geiger counter and he was so miserably weak and nauseated that he couldn't immediately look into such a possibility. It might seem strange to people not familiar with veterinary science, that "Feisty," Gene, and "Breta" were all treated basically with the same medications and procedures. Each received massive vitamin injections and ferrous sulfate tablets, and antibiotics, in addition to their normal nutritional supplements and lots of rest. It took well over two weeks for them to show signs of recovery and renewed strength. A month later, Gene examined the photos of the disk, taken by the Morales sisters. The pictures were of poor quality and showed the saucer as little more than a blob, making them only a slightly better than useless. The pictures reminded him of the encounter and he shuddered, preferring to forget the experience, if only he could, but it haunted him. It still haunts him. Basically a shy, sensitive, even among his fellow university students, Gene avoided the topic of UFO's entirely and suppressed memories of the UFO encounter. He reviewed his notes and placed them in a folder, which he rarely opens. Years passed quickly and the UFO phenomena gained credibility and quietly Gene Cuthbertson began to study the UFO phenomena. He joined MUFON and helped organize the Orange County Chapter, but until now declined to relive the encounter or to write about it. NORTH-CENTRAL GEORGIA.-- JH a lady in Georgia was taking cloud pictures in her back yard on Monday, July 18, 2005. When she looked at the pix, what she saw in one of them shocked her. ROSWELL -- Don Burleson PhD writes, " In Filer's Files #30 dated (July 20, 2005) Tom Carey's refers to the Roswell impact site and states, "The site's location is not based upon mathematical models but upon accounts of military and civilian eyewitnesses who were actually there." Since Tom also mentions that he and Don Schmitt had employed their own "band of feasibility," I assume (there has been nothing else written on the subject) this refers to my article on "Roswell Trajectory Feasibility," at www.cufos.org, in which I demonstrate mathematically that there is a relation between object velocity and altitude on the one hand and, on the other, how far downrange from the debris field the UFO could have fallen. I wish to point out that mathematical arguments simply say what they say, and valid witness accounts must ultimately be consistent not only with each other but with scientific fact. I have shown that if the object was flying at an altitude and velocity consistent with witness sightings (i.e. low enough to be seen as described, and not so rapid as to become invisible) and still managed to fall, say, 40 miles downrange, this would be inconsistent with the hypothesis that the object lost self-propulsion at the time of trauma. In such scenarios (where there was some reason to believe the object fell that far away from the Debris Field) it would follow that the object virtually certainly did not lose propulsion, which would be something we didn't know before. 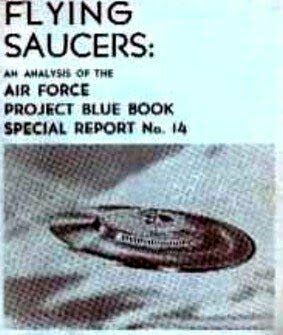 Nick Balaskas writes, Maybe after comparing the picture of the flying saucer that was allegedly taken by a 12 year old boy in 1956 above with the picture of the identical looking fictitious flying saucer on the cover of the U.S. Air Force's Project Blue Book Special Report No. 14 below, maybe Don and Richard will have one good reason not to believe the kid's story. Editor's Note: Many people claim the disk shown in the photos were experimental USAF aircraft. LORDSBURG ­ Benjie Meding sent me a remarkable video showing many UFOs in the area around his home in southwest NM. He sent a total of one hour and twelve minutes of various UFO shots. Most were of white unidentified objects that accomplish various maneuvers. The video also had dark F-117 Stealth fighter aircraft. Electrical Engineer John E. Combest who has been studying George Ritter's images writes, "I feel certain that what we are seeing is a glimpse of what can be done when the knowledge and technology is available to produce and properly utilize extremely powerful magnetic fields applied in a complex manner at very high frequencies." The result of such applications is to be able to produce and control changes in the structure and behavior of materials, and to achieve results which are not possible using only the intensity and frequency ranges commonly available in industry. James M. McCampbell who was a physicist and at one time Director of Research for MUFON had stated that very high electromagnetic frequencies were known to be associated with UFO propulsion systems. He believed that UFOs were "metallic machines exhibiting flight technology exceeding Earth-based knowledge." According to one of the books by Raymond Fowler, the often-abducted Betty Andreasson once asked the leader of the grays who usually picked her up how it was that they were able to enter her house through the closed kitchen door, and the leader stated, "We control the vibrations." And that statement seems to imply that they are able to control the rate (frequencies) and manner in which electrons, atoms, and molecules interact with one another, and thereby succeed in being able to cause one type of solid matter to pass through another type of solid matter with no permanent restructuring of either type of matter. I myself on one occasion was involved in an event during which solid objects were made to pass through one another with no detectable interference. Magic is not involved, and neither are time warps, or different "dimensions", but a manipulation of the commonly understood "laws of nature" by using forces unknown to almost all human scientists. WENATCHEE ­ I was sitting in my backyard having a coffee on July 13 2005, at 9 PM, when I happened to look up into the sky. I observed a cylinder shaped object. It appeared to be at the altitude of a commercial airliner, moving somewhat slower than a commercial jet. If it was at the cruising altitude of an airliner it would have been at least one and a half their size. The thing seemed to yaw slightly as it moved from the northwest to the southeast. It was definitely cylinder shaped with no wings or vertical stabilizer. I observed sunlight glinting off its surface. SECRET -- Documents released by the Northern Territory Government reveal a mass of UFO sightings across the Top End, many of them unexplained. The documents - declassified after 30 years under lock and key - detail a history of UFO activity across the Territory by a wide range of 'sighters', including RAAF crews and weather forecasters. The files were classified and only became available to the public from the National Archives in Darwin, after 30 years. One sighting, by the crew of a RAAF Hercules in Darwin in 1968, also appeared on radar, although no known aircraft was identified in the area at the time. The crew described a series of lights which crossed their take-off path from Darwin airport, with no visible fuselage or structure. RAAF command in Sydney said the contact may have been a foreign aircraft. The fact the sighting was made by an RAAF aircrew and detected by the aircraft's radar leaves very little doubt that something was in the area," RAAF command said. "As the aircraft has not been identified, a violation of our national airspace cannot be discounted." Another of the secret documents, obtained by the Australian UFO Research Association, describes a sighting by a weather bureau forecaster at Daly Waters in November, 1966. The forecaster was tracking a weather balloon with a theodolite when he noticed a flying object in the sky. He reported sighting a metallic-gray, oblong object flying at high altitude. Note: Last week the very same object was seen along Highway 21 about in the air near Milleton Hall. 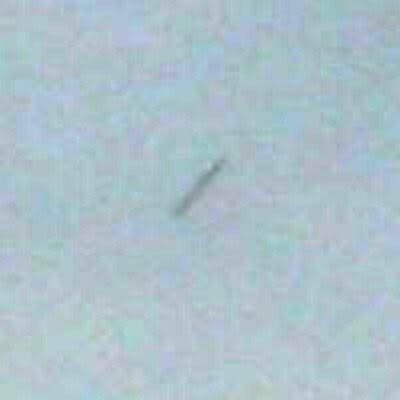 It was observed in a stationary position for 9 minutes before it slowly flew at a 1000 feet in a northeast direction. Thomas phoned and said he just seen a photo from Idaho similar to his sighting. 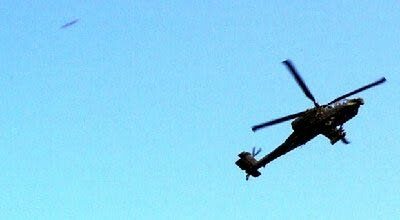 TIKRIT -- Charles E. Ratliff, 1SG writes, "I'm currently serving in Iraq and took the attached photo of an Apache Attack helicopter with a Nikon Coolpix 5200 Digital Camera." There is another object to the upper left of the gunship. 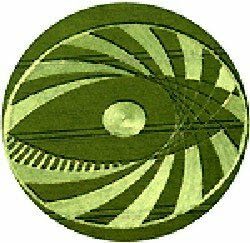 BRACKNELL NEWS -- UFOs were sighted in the sky over Crown Wood on July 19, 2005, when Maurice Jones looked through his binoculars that he uses to spot birds. But when he and some of his family saw not one, but two UFOs hovering above their house at 4 PM, they knew something strange was happening. They got some neighbors to look as well. Maurice, 50, a Parcel Net courier, said his 12-year-old daughter Alaina, spotted the strange object first. for majorstar@aol.com. You may use Paypal, Visa, American Express, or Master Charge. MUFON UFO JOURNAL -- For more detailed monthly investigative reports subscribe to the MUFON JOURNAL. A MUFON membership includes the Journal and costs only $45.00 per year. To join MUFON or to report a UFO go to http://www.mufon.com/. To ask questions contact MUFONHQ@aol.com or HQ@mufon.com. Filer's Files is copyrighted 2004 by George A. Filer, all rights reserved. Readers may post the COMPLETE files on their Web Sites if they credit the newsletter and its editor by name and list the date of issue. These reports and comments are not necessarily the OFFICIAL MUFON viewpoint. Send your letters to majorstar@aol.com. Sending mail automatically grants permission for us to publish and use your name. Please state if you wish to keep your name or e-mail confidential. CAUTION, MOST OF THESE ARE INITIAL REPORTS AND REQUIRE FURTHER INVESTIGATION.